Maine became a state March 15, 1820, the 23rd state admitted to the Union. Settlers from Plymouth Colony established a trading post in this area in 1629, but fur trading declined over time and the Kennebec Patent was sold in 1661. It was 1754 when Fort Western was built on the Kennebec River as a supply depot for Fort Halifax, which was beyond the navigable reaches of the Kennebec. As other settlements grew along the river and joined together, names changed from Fort and Hook to Harrington and Hallowell, but in 1797 Augusta became the permanent name. Although accounts differ, Augusta may have been chosen to honor the daughter of Gen Henry Dearborn, a Revolutionary soldier who was elected as a Representative to the Continental Congress from the Kennebec District. Her name was Pamela Augusta Dearborn. Today, although 39 miles from the sea, it is the head of navigation on the Kennebec River, serving the food processing industry, and as the seat of state government. 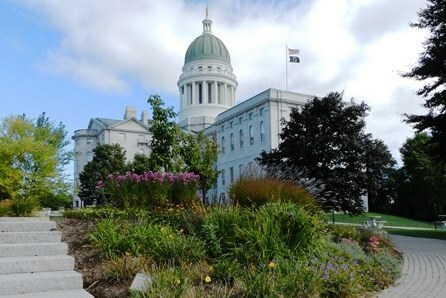 Augusta’s impressive capitol was designed by Charles Bullfinch, and rises majestically above Capitol Park and the Kennebec. On top of its 185-foot dome is a statue of a woman bearing a pine bough torch. Old Fort Western, the oldest wooden fort in the country, has costumed guides interpreting life in the 1800’s. Maine State Museum has displays of a textile factory, granite quarry, ice harvesting, lumbering, fishing, and shipbuilding. Acadia National Park is nearby, on the coast. The capitol balcony and the rocking chairs, looking across the sweep of the hills; the old Fort and the campfire smoke; the moose warnings on every road; the beaches and the mountains near; the absolutely everything. Mountains near: Appalachian. Mount Katahdin, in the north central part of the state, is the highest point in Maine at 5,269 feet.